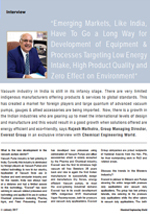 Vacuum industry in India is still in its infancy stage. There are very limited indigenous manufacturers offering products & services to global standards. This has created a market for foreign players and large quantum of advanced vacuum pumps, gauges & allied accessories are being imported.